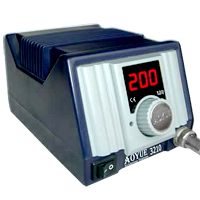 AOYUE INT3233 70W Soldering Station is an ESD-safe microprocessor controlled soldering station equipped with a fast acting induction heater suitable for advance lead-free soldering. Soldering Station Aoyue 938 a miniature held station, designed for soldering small SMD components. 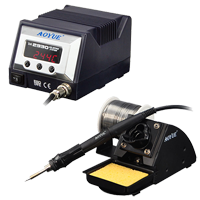 AOYUE Int3210 70W Soldering Station is an ESD-safe microprocessor controlled soldering station equipped with a fast acting ceramic heater suitable for advance lead-free soldering. 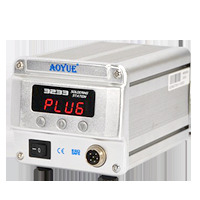 Aoyue Lead-Free held station Int2930 is a Lead-Free controlled by a microprocessor held station with temperature control and memory function. The station has a sleep function and automatic wake-up calls by a vibration sensor in the handle of iron, which detects motion. 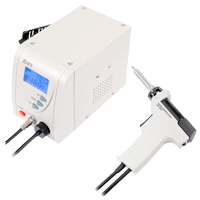 Jovy iSolder-40 soldering station is latest invention for lead free soldering with wise touch technology and concept of "variable power for variable temperatures". Invincible, control using the tip for sensing the thermal energy requirements for the target precisely when it touches the solder joint surface, and prevents overshooting without any calibrations. Intelligent, the auto-power regulation and recovery control provides the different temperature levels needed for melting any type of solder material alloys at any volume. Auto sleep mode and auto standby mode implemented for power saving and longer tip life time. Inconceivable, the easiest operating method exists for soldering stations, by two colour led indicators with four operating modes. iSolder-40, is the combination of fashionable design and ease of use hand –piece for more control and comfort. Lead-Free Soldering Station QUICK-236 ESD is used for SMD components mounting and rework, soldering common and directly-inserted electronics and lead-free soldering. It is a new soldering station with a traditional heating system (ceramic heater), characterized by a 90 W power, temperature adjusment from 80°C to 480°C and temperature stability of ±2°C. 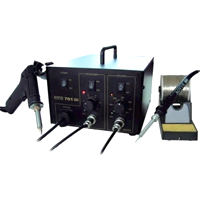 It is manufactured by Quick Electronic Equipment Co., Ltd.
NET 701A+ soldering and desoldering station built together for maximum performance. 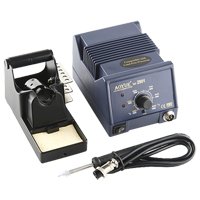 Designed for all types of PCB repair, easy to operate soldering/desoldering functions. The desoldering tool comes with zero crossing circuitry preventing electrical surges. Soldering iron incorporates a ceramic heating element providing long service life. 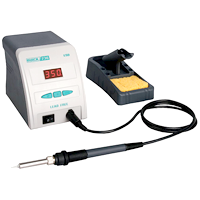 Quick 202D 90W Soldering Station incorporates a double digital temperature display indicating the desired set temperature and the actual tip temperture. 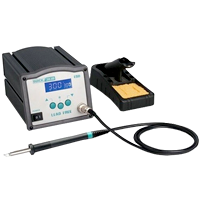 With standard Quick Electronic soldering station features such as Auto Sleep and Auto Shut-off mode, periods which with the 202D can be set, and with excellent temperature compensation speed ideal for Lead Free soldering. 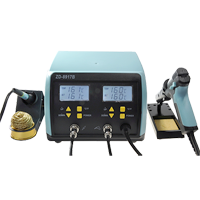 Soldering + Desoldering Station ZD-8917B 2in1 is made of high quality components, it is characterized by high precision operation. It can be used for soldering / brazing all types of integrated circuits of the tile without damaging them, and conventional soldering electronic components. 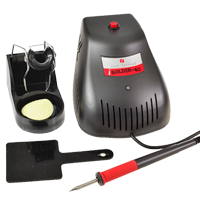 Soldering / Desoldering Station 915 is designed for lead-free soldering. Fast heating and high power provides convenient soldering / desoldering ICs. Proper construction, one-hand operation and high power absorbing allows for easy removal of residues of solder from one-sided and double-sided printed circuits. 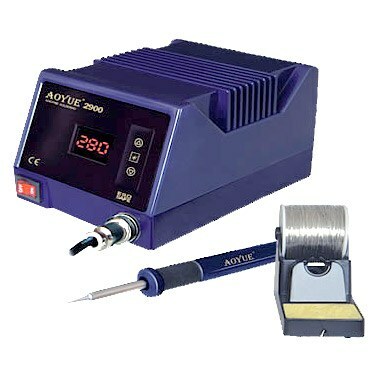 AOYUE Int2901 70W Soldering Station High capacity soldering station with high power and high insulation. Fast recovery, minimal heat loss, ideal for continuous production soldering. 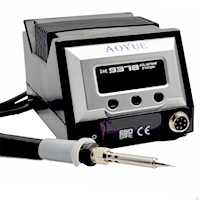 Soldering station AOYUE 2900 70W, ESD SAFE lead-free soldering station, digitally controlled. LED display with current temperature display, ESD SAFE protection. Thanks to the unique construction of the tip in which both the heater and the sensor are mounted. The end of the tip achieves the desired temperature immediately. The construction of the crotch as well as the heat-permeable mat allows for a rapid change of the tip when it is even hot. 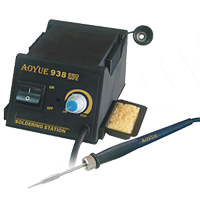 Soldering Station Aoyue Int936 soldering irons with analog temperature control. 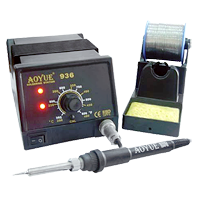 Soldering station Aoyue Int9378 is a 60 watt Microprocessor controlled digital soldering station which has a 1 degree C temperature control.